We’ve used whole chestnuts and chestnut purée to really hero this earthy, nutty ingredient. Paired with iron-rich greens, bacon and cream and then stuffed inside chicken supremes, this is one of those can-I-have-a-moment dishes. Heat the oven to 200°C/180°C fan/gas 6. Chop 80g of the whole chestnuts and set aside. Melt the butter with 1½ tbsp oil in a pan over a low-medium heat. Cook the leek with a pinch of salt for 10 minutes, stirring occasionally, until softened. Stir in the garlic, herbs and chopped chestnuts, then cook, stirring, for a few more minutes. Mix in 2 tbsp chestnut purée and 1 tbsp double cream, then stir over the heat for a few minutes. Remove from the heat and set aside until cool enough to handle. Season. Meanwhile, in a large non-stick frying pan, fry the bacon over a medium heat for 5-6 minutes until golden. Add the rest of the whole chestnuts and fry in the bacon fat for 2-3 minutes more. Set aside on a plate. Add a good splash of sherry to the pan and bubble for 1 minute, then use a wooden spoon to scrape up any bits stuck on the bottom of the pan. Pour the sherry from the pan into a bowl and set aside. Wipe out the pan with kitchen paper and keep the pan to hand. Make a pocket in the sides of both chicken supremes, above the fillet (see Know-how). Stuff with the chestnut mixture, cover with the fillet and secure with cocktail sticks. (If you’re using smaller chicken breasts, you might find you have stuffing left over. If so, add it to the pan when you make the sauce for extra flavour.) See Make Ahead. Heat the remaining oil in the frying pan over a medium heat. Fry the stuffed chicken, skin-side down, for 5 minutes until golden. Turn the chicken and cook for a few more minutes to brown the other side. 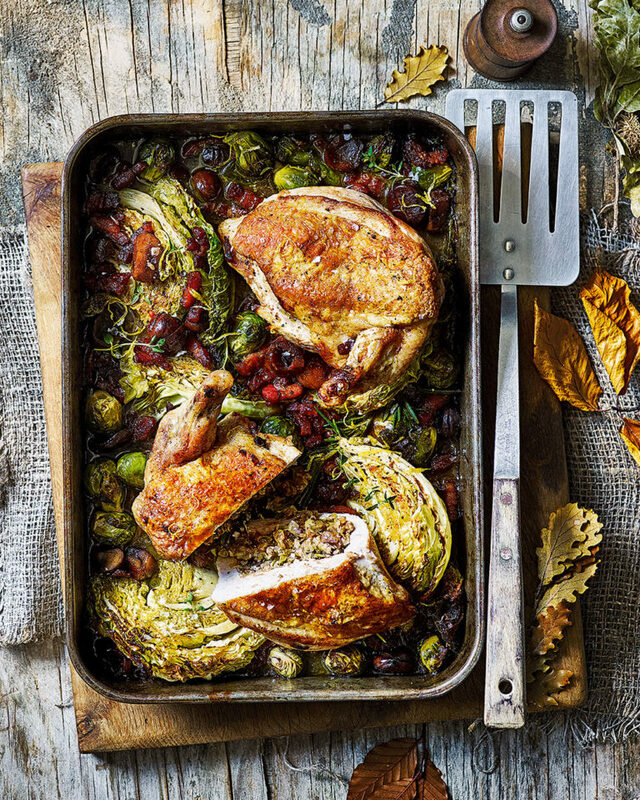 Arrange the cabbage, sprouts, chicken, bacon and chestnuts in an ovenproof baking dish. Add another splash of the sherry to the frying pan, put over a medium-high heat and scrape the base with a wooden spoon to release any chicken bits from the pan. Pour in the cooked reserved sherry and any remaining sherry, along with the rest of the 2 tbsp chestnut purée and the remaining double cream. Season, then gradually stir in the chicken stock. Simmer for 6-8 minutes to reduce. Season to taste. Pour the sauce around the chicken in the baking dish, then bake for 40 minutes (if using smaller chicken breasts, check after 30 minutes) until the chicken is cooked through and the cabbage is lightly charred. Scatter over the lemon zest to serve. To purée the chestnuts, boil, then peel and whizz with a little water until smooth. Prepare the chicken up to the end of step 3 up to 1 day in advance. Cover and chill until ready to cook. Chicken supremes have the meaty wing bone and fillet (or false fillet) still attached. They’re larger than standard chicken breasts, so 2 supremes could serve 4 people. Red bordeaux, preferably a médoc, is a star pairing here.